Formulated by Efrem Korngold and Harriet Beinfield. Since time immemorial, healers have been stirred by the imperative to do something for their patients. In response to the ever present need to remedy pain and suffering, the Chinese in the 11th century, and the Europeans, in the 19th century, invented herbal formularies and established factories to produce readymade medicines available to the public without a prescription. Commercially prepared medicines were not formulated based on a theoretical model of healthcare, rather, they were the product of an empirical, pragmatic tradition that paralleled the rational framework of acupuncture and dietetic medicine articulated in the Huang Di Nei Jing. These medicines were packaged and marketed so that any literate person, including medical experts, could study what was available in the pharmacy, read the indications, and choose a remedy that suited the symptoms or condition needing treatment. Sage Solutions are one of the most recent contributions to this tradition. We are in the same position as our ancestral forbears. We are challenged daily to provide effectual remedies for people\'s problems. Time is of the essence when a man is on edge with hay fever and sinusitis; a woman is at the end of her tether with unrelenting hot flashes; a child is in crisis with eczema and asthma; or when a woman has persistent post-surgical constipation. Sage Solutions can elegantly and efficiently assist. Their properties and indications are easily understood and therefore accessible for the quick and effective resolution of a wide spectrum of ailments. They are sage because they embody the wisdom of centuries of knowledge and experience. They are solutions because they solve the real problems that patients face. The Sage Solutions repertoire now includes 22 remedies designed to address a diverse spectrum of specific problems, from Bug Beater for the common cold and flu, and Passion Potion for diminished sexual capacity, to Cluster Dissolving for lumps and masses. Sage Solutions may be used singly, combined with one another, or with Chinese Modular Solutions and Gentle Warriors. Bug Beater, Chill Chaser and Enviroshield expand the scope of anti-inflammatory, anti-toxin and anti-pathogenic remedies including Phlogisticlean and Head Clear, enabling the practitioner to effectively treat a variety of acute and chronic infections and allergies. 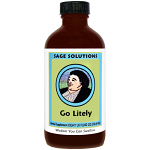 Lax Lite and Max Lax complete the spectrum of remedies for digestive and metabolic disorders that also includes Digest Aid, Meal Mover and Weight Manager. For Weariness and weakness due to overwork, mental or emotional strain, and lack of sleep, this formula renews bodily strength, mental determination, and enthusiasm by fortifying the Three Sources of Qi. This formula is intended for use with acute constipation. Use for symptoms of constipation. Harmonizes the interaction of the Kidney, Liver, and Spleen, adjusts the circulation, and amends deficiencies of Qi, Blood, and Moisture, preventing problems from developing and correcting them when they occur. This formula is specific for restoring and regulating healthy cycling in women of childbearing age, from menarche to menopause. It will help to alleviate premenstrual discomfort, irregular bleeding, midcycle disturbances, and infertility. This formula supports the Defensive Qi (wei) by helping the body to quickly and efficiently evict pathogenic influences (External Wind, Heat and Cold) and eliminate Phlegm, while at the same time supporting the Stomach and Lung, two of the primary sources of healthy Qi. This formula is a synthesis of those successfully used in Chinese clinical trials. Its therapeutic objectives are to invigorate the Kidney, replenish Essence, strengthen bones and tendons, fortify Yang, and vitalize Blood. This formula removes food stagnation by assisting digestion, regulating Qi, and activating peristalsis. It is appropriate for almost everyone, benefitting those with sluggish digestion, whether excess or deficient, weak or strong, undernourished or overindulgent. 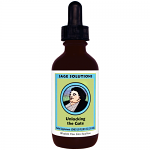 The five herbs in this formula rejuvenate and harmonize the entire organism, enliving awareness, augmenting defenses, and restoring vital secretions. Move Mountains enhances integrity, equanimity, and pliancy - the ability to adjust to taxing demands while still maintaining equilibrium. It can be used as an all-purpose tonic. These herbs support vital secretions and defenses, and enliven awareness by restoring the Three Treasures -- Jing, Qi and Shen. Passion Potion (Aging Solution) , 300 tabs. Passion Potion (Aging Solution) , 60 tabs. Herbal formulas which strengthen the Kidney Network and replenish its essences are known to stimulate the bone marrow to produce blood cells and to increase the numbers of hormone receptors on cells and the hormones present in blood and tissue, particularly in the brain, spinal cord, sense and reproductive organs. 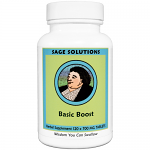 By enhancing the overall capacity of the organism this formula promotes health and long life. Passion Potion (Aging Solution), 120 tabs. By enhancing the overall capacity of the organism this formula promotes health and long life. This formula dissipates Phlegm nodules by purging Phlegm, Heat and Toxins from the Blood and the lymphatic system. This formula is based upon both ancient tradition and modern research. In traditional terms, it tonifies Qi and Wei, nurtures Blood, secures and replenishes Essence. It benefits the Spleen, Lungs, Heart, Kidney and Liver. In modern terms, it improves the overall adaptability of the body's regulatory mechanisms and is appropriate for general conditions of debility and lowered resistance. Written by Harriet Beinfield, L.AC. and Efrem Korngold, L.AC, O.M.D. Sage Solutions pocket guide is an excellent resource to read up on the 22 formula's in this product line as well as ways of ways of combining these formulas and protocols for treating additional symptoms. Most people with weight problems in our culture are found at the overweight end of the spectrum. In most cases, regardless of the precipitating causes, regulating Yang and promoting the function of the Kidney and Spleen will help to control and correct metabolic imbalances. Accordingly, this formula supports and regulates Yang, promotes the normal functions of the Kidney and Spleen, and aids in the elimination of accumulated and undigested food, surplus fluid, Damp Heat, and Phlegm. Wise Woman's Well, 1 oz. This formula averts or reduces acquired deficiencies of Moisture, Blood, and Essence. Its primary objectives are to strengthen the Kidney, replenish the secure Essence, nourish the Liver, support the Spleen, and harmonize the pivotal relationship between the Kidney and Heart. Wise Woman's Well, 2 oz. Wise Woman's Well, 8 oz.